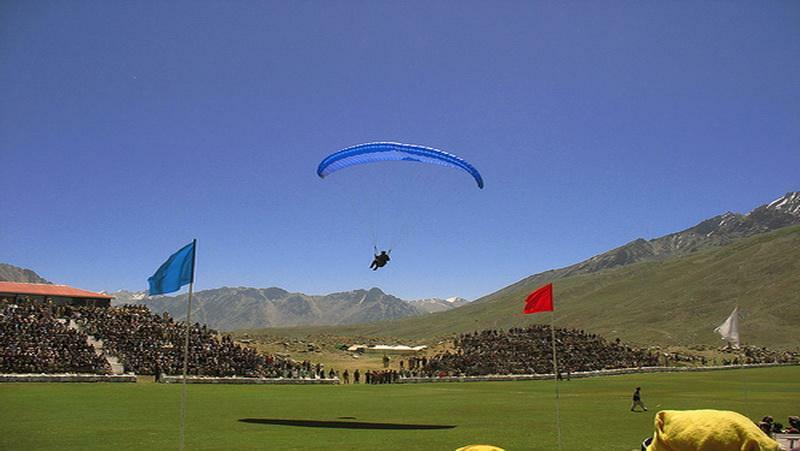 Home Destinations Royal Polo Grounds Shandur Polo Ground, The Highest Polo Ground in The World. Shandur Polo Ground is naturally designed to be a polo ground. Small hills are on all four sides of the rectangular ground, where spectators can sit and enjoy the match. The surrounding landscape and Shandur Lake makes it even more beautiful. Shandur is situated at an altitude of 12,500 feet (38000 meters) above sea level is famous for having the highest polo ground of the world. It is sometimes called Roof of the World. It is located in District Ghizer, Gilgit–Baltistan, Pakistan. The version of polo game played in Shandur Polo Ground is considered to be the purest of all. It is also called freestyle polo. Shandur Top (el. 12,200 feet (3,700 m)) located in District Ghizer of Gilgit-Baltistan. Shandur-Top in Ghizer is often called the ‘Roof of the World’ where the Hindukush in Gilgit-Baltistan, between Afghanistan and Gilgit- Baltistan and Karakorum mountainous ranges of Gilgit-Baltistan meet. The top is flat, a plateau and can be crossed between late April and early November. The grade is very gradual, and the area is crossed by small streams of trout. Grazing in summer is plentiful. Shandur invites visitors to experience a traditional Polo tournament which since 1936 has been held annually in the first week of July between the teams of Gilgit-Baltistan and Chitral. The tournament is held on Shandur Top, the highest polo ground in the world at 3,700 meters (the pass itself is at 3,800 meters). The festival also includes Folk music, dancing, and a camping village is set up. The polo tournament is featured in the first episode of Himalaya with Michael Palin. The beautiful polo ground of Shandur turns into a city of tents each year between 7 and 9 July due to Shandur Polo Festival. A match of polo is held between teams of Gilgit and Chitral. A great number of tourists and spectators from different areas of the country especially from Hunza, Skardu, and Chitral come to attend this event. Shandur Polo Ground is located at an altitude of 12,200 feet (3,700 meters) and it is very hard to play here due to the reduced amount of oxygen. It requires a lot of stamina and players must be physically very strong. The match is always marvelous because cream players from Chitral and Gilgit participate in it. Shandur is the highest polo ground in the world. Here it is still played in its original form, a game as tough rough and hard, on man and horse as the surrounding mountains themselves. A game without rules or empire, a game with only a few agreed convention of play. Polo in Khowar called “Istoorghar” has been the traditional game of Chitral, as our motto is “we play polo the game of king and king of the games”. The game is commonly played in the music band comprising a big drum. Previous articleShigar Fort, a Royal Fort Locally Known as The Palace on Rocks.